After a five-week break to sort out things on the domestic front, we’re pleased to report that our National Park road trip is back on track! This week’s destination: Acadia National Park on Mt. Desert Island in Maine. We first visited the park last spring just for a weekend, and we’ve returned this year for an extended stay. We’ll spend four nights at a cozy B&B in downtown Bar Harbor and then an additional four nights at a campground within the park. Acadia National Park was the first park established east of the Mississippi River. It is also notable for the fact that its designation as a park was spearheaded by local residents, many of whom (like George Dorr and the Rockefellers) were wealthy owners of summer homes on the island. Today, a handful of private residences are still scattered throughout the park, and sections of the famous carriage roads on private land abutting the park are off-limits to bicyclists. I’m not sure of the behind-the-scenes land politics, but as a casual visitor, it seems the public-private boundaries enjoy an easy coexistence. We hadn’t been on our bikes in several months, so before heading out to tackle 20 or 30 (or more!) 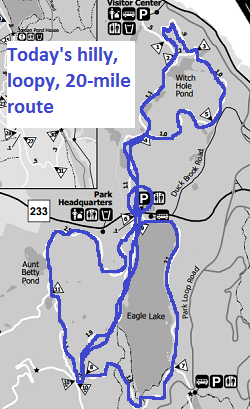 miles of road, we opted to start with a short 10-mile loop between Northeast Harbor and Jordan Pond. Although there are more than 40 miles of carriage roads to explore, it’s pretty hard to get lost. Roads are well-marked with numbered signposts that also include directional signage for popular park destinations like Jordan Pond House or Eagle Lake. The Park Service also provides a carriage road map that indicates mileage between signs. Those of you who haven’t been to Acadia might share my initial romantic vision that carriage roads are pleasant and flat, probably made of packed dirt or maybe even paved. They are not. While they are indeed pleasant, they are the opposite of flat. They are groomed with crushed gravel (which can be loose and slippery under mountain bike tires) and they rise and fall repeatedly, climbing and descending hundreds of feet depending on the route you select. Today’s route was a new stretch of trail for us, and the climb started immediately from the parking lot. Although our legs and lungs are well-conditioned from running, we were winded and weary at the top of some of today’s hills, quads burning. But the rewards were worth the effort. We enjoyed sunny skies, sweeping vista, secret streams, and of course…speeding downhill while grinning like kids, trying not to lose complete control of our bikes or eat facefuls of gravel. In that way and many others, the day was a great success. And it’s only Day 1! –J.